normally to place the controls in a program like 3ds max I would create a object and align it's position and orienatation to the bone I would then move only the object (leaving the hotspot where it is) to a position that is easy to click. I know how to align my objects position to the bones position in Carrara but I don't know how to align orientation or move just the object and not it's hotspot. Does anyone know how I would do this? Also are Control rigs used often in Carrara or do most users just animate the bones? You can Release / Lock the hot point for an object by hitting Caps Lock for on and off. this allows you to reposition the hotspot without moving the object,. but if you select the object the hotspot will still move relative to the object. For an IK rig, you would either use the IK chain (which should create a cube "target helper" for you) or you can insert target helper objects and change the display size and colour in the effects tab, then use EDIT / Align,.. or position it manually, then add the target helper as the object to track in the Inverse Kinematics modifier,. in the modifiers tab. I think we'd need a poll to answer that one :) ..depending on what I'm doing, I use both methods. Depends on what you mean by "control rigs". Carrara is not nearly as advanced as some other animation apps when it comes to control rigs. If you're referring to stuff like "set driven key" and "expressions" and sliders, Carrara doesn't have them. But if you're just talking about inserting an object which is used as a simple handle to grab and control an IK goal, then yeah, you can do that in Carrara. And yeah, you can translate and rotate that object's hot point to match the location/rotation of a goal. And Carrara does have a few simple tracking functions. But if you're talking about, for example, a single slider that controls multiple bones and IK goals, Carrara doesn't have it. So, for example, you're gonna have a tough time setting up a standard "heel/toe/foot roll" control that animates the action of a foot contact and roll during a walk cycle. My guess is that most people just use the standard IK rig that comes with the content, and either move the IK goals directly by hand, or just use FK. I doubt many people even worry about foot roll, etc. This allows you to set up relationships between one parameter and another - the controlling parameter can even be in a separate object, allowing you control one character from another, etc. Time delays are also supported, allowing some clever animations with a degree of simplicity (once you have set up the relationships). Yeah, I suppose that might help, though honestly I have no clue. If you're anything like me you've given up trying to figure out what the plugin REALLY does, since there really is no decent documentation, at least that I can find. Unless you want to drop $50 and hope for the best. Though after a lot of research I think I discovered that you can make sliders. Though I'm not sure. And I don't think it has expressions. And I'm not sure if you can control multiple parameters with another parameter. And I have no clue what sort of relationships you can set up between parameters. Has anyone used it to build a fairly complex control rig, like a foot roll? I agree that ERC can be a bit mind-bending! You can certainly control multiple parameters from just one - I remember setting up the ailerons on a biplane so that rotating one controlled the other three, with those on the left going in the opposite direction to those on the right, as it should be. And you can use maths (or as you Americans would have it, math) in the expressions. So yes, complex but potentially very powerful for animation. There are some good tutorials on ShareCG by Fabaone. I've created many rigs in the past with basic Carrara built-in methods and also with ERC advanced methods. the limits of ERC and if it can be used for character animation. A foot roll controller like the one Joe posted, is in a basic form even possible with Carrara built-in methods. but if you want to have create some more advanced controls inside of Carrara, you need ERC. Another way to use advanced animation controls inside of Carrara is to make yourself familiar with the creation of CR2or DUF characters. I had several experiments to include my controllers inside a CR2 with quiet good results. The major disadvantage, which Carrara had compared to other software packages, is that not all effects do show up in real time, but only after releasing the mouse button. This is for all 3 control methods: Carrara-built-in, ERC and CR2-built-in controls. Faba, is there a simple instruction manual posted anywhere that explains the features and implementation of the ERC plugin? I've seen a lot of videos and images along the lines of "look what I've accomplished with ERC", but nothing that explains simply what features it has. DAZ used to have a feature in the store alongside the item on sale where you could take a look at the instructions. Unless my memory is off on that. It sure would be nice to see something like that. It's a bit mind boggling that you have to run all over the place just to find out what features a product has. Though the lack of realtime response you mentioned is real painful, and for me is a nail in the coffin. so to speak. I've experienced that before with other apps and it was dreadful. It allows to link parameters. You have a "driver" parameter and a "driven" parameter. The driver gets an influence on the driven parameter. For example these can be a translation driving a rotation, a rotation driving a morph, a translation value driving a color value. On the first glimpse this doesn't sound very exciting. "Why should I buy an expensive plugin if i can do all of this by hand?" and then never have to care about the driven parameters again, because it works automatically. Another reason to use it might be that the Carrara interface is spread about several tabs and rooms. For example if you want to animate a shader parameter you have to switch to the shader room each time to animate it manually. With ERC you can link the shader parameter to an object in the main view or a slider modifier, which is also part of ERC. If you are familiar with other 3D packages you possibly have seen similar features there too. can be complicated to set up. Again, I get the basics, I've used many professional apps with features such as "set driven key" and expressions and equations. I believe I asked Fenric about this long ago and he said no to some of the stuff I wanted, but I'm not sure where it is now. Anyway, thanks for the help. - Property explorer (enables you to have a look at the Carrara internal values of a parameter and not the ones that Carrara shows you in the interface, which might bring some light into how to use it, like how many radians (internal) 90 degree (interface) are or how many inch (internal) a meter is. I hope I didn't forget any feature. but to set up a complex expression within one modifier is not possible (as the formulae modifier). Though I was able to create some more advanced relations with the use of helper objects. I don't know Maya or Lightwave, so I can't tell you how ERC is compared to those. Those are some pretty interesting rigs you show here. What's the chances of seeing a Tutorial or two on how to create some of these rigs and controllers. I'm with JoeMamma2000 on this one, I bought your ERC plugin on the first day of its release hoping to achive some of the things you illustrate here, but I have yet to make heads or tails of the darn thing. About your tutorial wish, what type of characters are you using? Custom Carrara native characters or Genesis, Victoria and friends? Or do you create your own Poser/ DAZ chars? Carrara ERC belongs to Fenric only. I neither own any part of ERC nor do I earn money from it. I thought I had posted a reply, but apparently DAZ decided to eat it. - Faba has covered all of the major points. Yes, the ERC plugin is limited to very simple operations - it does not allow for scripting or advanced formulae. "Oscillate" is a basic sin(x) function, but that's the fanciest it gets. I would entertain other basic operator-style functions as a free extension, but it will never be like the function modifier or PyCarrara, no. - The documentation has disappeared from DAZ's site. But the basic function is a simple association of one value on one object to one value one one other object. 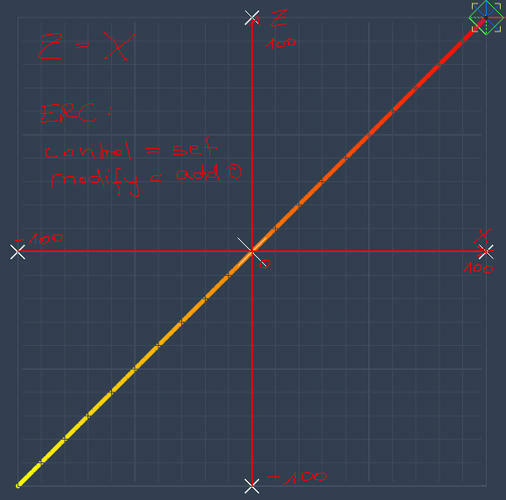 There is a convience feature where you can link x,y,z on one thing to x,y,z on another - but that's it. - It is certianly true that most of the things that ERC does could be done without it. You might have to create a Poser-style CR2 and edit the links with a text editor, or use a combination of modifiers and tweeners, but there is very little that you CAN'T do without it. But it makes it easier! Thank you for the reply faba, and of course you're right ... it is a Fenric plugin. My mistake, Sorry Fenric! I have all of your articles from sharecg, but I guess I'm so used to video tutorials (step by step instructions) that I find it difficult to wrap my brain around the concept you are trying to relay. As for my characters, they are all human characters created by me in Carrara--well all two of them, and I have been considering Genesis and MakeHuman for my "people needs" cause mine really don't look that good. But for now it's the rigging process that I'm really focusing on at the moment. I could learn and use Blender, or Modo (nice rigging tools in that one), but then how do I get them back to Carrara fully rigged? In short, I can't. I think Carrara has a lot of potential as far as rigging is concerned. Watching a ton of blender tuts on the topic and then seeing some of your examples such as the face rig and full body rig, makes me say "I'd like that type of rig for my characters". "Fenric's ERC" I think goes a long way rigging a lot easier in Carrara, but as of yet, I haven't been able to successfully implement your "ERC hand control" on my models. Reflexive sets ERC so that the value source and destination are the same, where you want to modify a value based on itself rather than based on something else. I hadn't added Modulo. That would not be difficult to add. I've used similar features in other applications. However, I can't figure out exactly what ERC does. Imagine someone who is coming into it cold, with no experience. It must be confounding, to say the least. I realize you're a programmer, not a documenter. However, keep in mind that your customers probably have no clue what you're talking about. ERC means nothing to most people, including me. Nobody knows that "reflexive" means "equals". Nobody knows what "modulus" means, or what it does. Most Carrara users are unfamiliar with terms like "sliders" or "expressions". So my suggestion is that you somehow develop some very simple documentation that shows, graphically, what features your plugin has, and how the average person would use it. And put it all in very simple terms. For example, sliders are very cool and very useful. If that's a feature, then show a very simple animated GIF with a slider controlling the grasping and opening of a character's hand, for example. And list the features in terms people can understand. Most people aren't going to make very much effort to try to understand what a product does. With your ERC plugin, aside from being turned off originally by a name I didn't understand, I've tried very hard to figure it out, and I'm still unclear. Few people would make nearly the same effort. This is a basic coordinate system. It has a range from -100 inch to 100 inch. 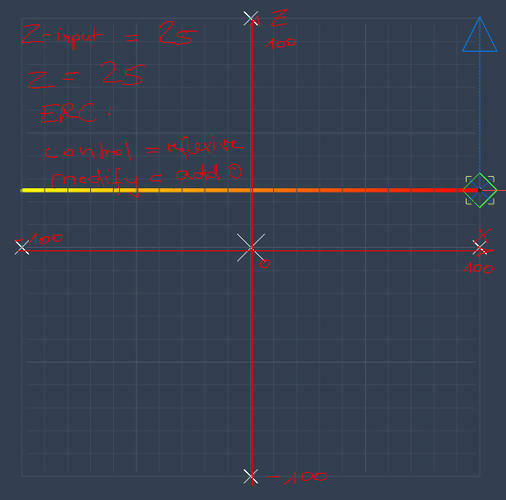 Horizontal is x and vertical is z.
I have set up an ERC-modifier that way: x is the driver and z is the driven parameter. x values start with -100 and end with 100. The z value is driven by the x value with the "set" control. The z value is driven by the x value with the "add" control. 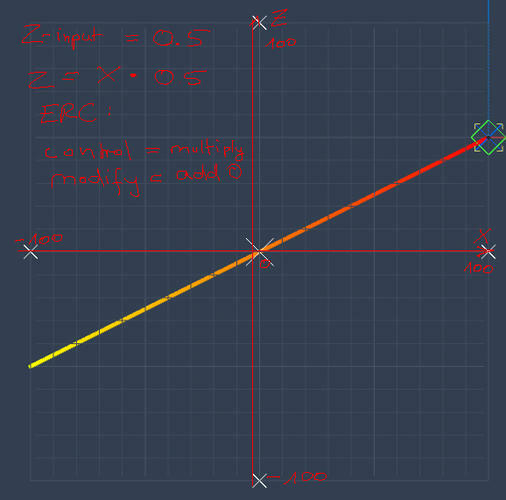 The z value is driven by the x value with the "multiply" control. 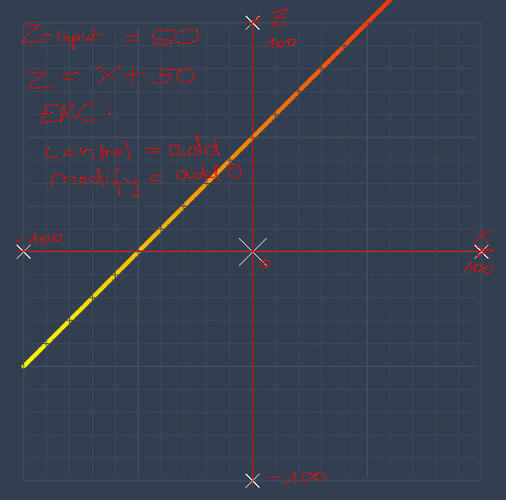 The z value is driven by the x value with the "reflexive" control. So it only does something if the modify does something other than add zero. So would modify of multiply and providing a value of 0.5 result in the actual value being half of what was set? It would be nice to have, effectively allows looping over a set of values. Modulo is inherently integer math though the notion can be extended to floating point. Would your implementation coerce operands into integers? Or do floating point modulo? Or something else? The essence of ERC is simply "When I do X, I want Y to happen". So - when I turn one wheel, I want all four to move the same; when I bend the arm, I want the biceps morph to be applied automatically. Half the issue of explaining it is that once you get your head around it, it can be used for so much. And with delay function applied to chains of objects, you can make results that would take ages to do manually. Half the issue of explaining it is that once you get your head around it, it can be used for so much. And with delay function applied to chains of objects, you can make results that would take ages to do manually. And now you can see why advertising firms can have such a difficult job sometimes. The challenge is distilling it down to simple, understandable phrases and images. Yeah, you can do a ton of stuff with it, but you can say the same for Carrara. You can do an infinite amount of different things with Carrara, and the challenge is to explain the features with images and concepts so that people can understand it. And IMO, it's far easier with something like ERC. A picture is worth a thousand words, and a well done picture is worth an entire book. IMO, it's basically an "Animation Controls" plugin. One thing controls another. You show an anim of a mouse cursor moving a slider, which causes a character's hand to open and grasp, and you've explained the basic concept. Then you explain that it includes Motion Controls, Morph Controls, Shader Controls, Light Controls, whatever. And you provide simple graphic examples of each category in operation. I doubt there are more than a half dozen general categories, so it shouldn't be too tough. And then you make it clear what its limitations are for those who may be familiar with similar functionality in different applications. Which is why I suggested you post user manual that includes examples of stuff you'd want to do and how to do it. I looked in the store at your plugin, and honestly the accompanying image doesn't tell me a thing about what the plugin does. It shows an Aiko or whatever and a list of some parameters, but gives no clue about what it all means. Again, if you could insert an animated GIF like I suggested it might make a huge difference. And the writeup doesn't add a lot: "The Enhanced Remote Control suite is a set of behavior modifiers and scene commands that work together to add much needed functionality and control to your animation workflow"
I just scratch my head after reading that, and that's from someone who has a pretty good idea what it does. I saw a video tutorial on how to make a plane (using Carrara) and this demonstrated the ERC in action to control the ailerons etc. Danged if I can find it now - Was that your video Philw ? Can anyone provide a link ? Its well worth watching. Yes that was mine - it is part of the Advanced Carrara video training package by Infinite Skills (and available on the Daz store). Does ERC handle Angles rotation (ie, greater than 90 degrees), or just Quaternion? I seem to recall that the Track modifier in Carrara doesn't recognize if you have both objects set to Angles. It's a big deal if your animation has a controlling object turning past 90 degrees, but the controlled object just jumps around because it doesn't recognize anything over 90 degrees. It is absolutely mind boggling to me that Carrara has virtually nothing in terms of animation controls features like we're discussing. Seems to me that would be an extremely easy set of functions to program. Just the motion controls alone seem to be a no-brainer. An object's position/rotation is a function of another object's position/rotation. Heck, they've already got the Track function, which matches one object's position/rotation to another object's. Just take that code and expand it. And allow the user to insert expressions in there. Heck, they already HAVE an expressions/'formula' feature in the Modifiers, which allows the user to input their own expressions. And supposedly it already affects motion (tweeners). Although I don't think I've ever been very successful in getting it to work. How difficult can it be to apply that to some simple motion controls? Anyway, there's a long list of missing features that boggle my mind, but there ain't much you can do about it.